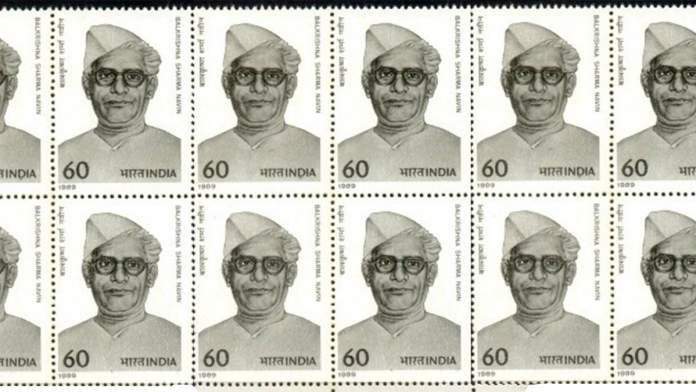 Balkrishna Sharma campaigned vigorously for Hindi to be declared a national language of India. He was awarded the Padma Bhushan in 1960. New Delhi: Hindi poet Balkrishna Sharma ‘Naveen’ was a member of the Constituent Assembly. He had made immense contribution to the fields of literature, journalism and politics in both pre- and post-Independence eras. Sharma was born on 8 December 1897, in Madhya Pradesh’s Shajapur district. His parents were Pandit Jamanadas Sharma and Radhabai. Sharma started his formal education late, after the age of 10, because of his family’s financial problems. Later, he got enrolled in Christ Church College in Kanpur, UP. In 1917, he came in contact with veteran journalist and editor of Pratap magazine, Ganesh Shankar Vidyarthi. Probably, a year later, he dropped out of college to join the freedom struggle. He became the editor of Pratap after the death of Vidyarthi in 1931. Sharma had been jailed by the British six times between 1921 and 1944, but this had little impact on him and he continued to contribute to the freedom movement. He was nominated to the Constituent Assembly from the United Provinces (now Uttar Pradesh). Apart from his political work, Sharma wrote many poems under the name Naveen. Some of his notable works include Apalak, Kwasi, Kumkum, Rashmirekha, Vinoba Stavan, Urmila, among others. Among his many admirers was former Prime Minister Atal Bihari Vajpayee, who himself was a poet. Sharma’s collection, Hum Vishpaee Janam Ke was published posthumously. Sharma had strongly objected to a clause tabled in the Constituent Assembly under the Rights of Equality, that sought abolition of titles conferred on individuals. According to the clause, the state should not confer any title on any citizen of India and that the individual must not accept any title from a foreign state. Sharma had urged other members of the Assembly to also reject this clause. However, that did not happen. “We have time and again tried to honour the dignitaries of this country in so many ways. We call someone ‘Acharya’, and Mr. President [Rajendra Prasad], we call you ‘Desh Ratna’,” he had said. “We call Mahatma Gandhi by the name of ‘Mahatma’. I consider it improper to make a decision against honouring our leaders as this tendency is inherent in our minds, our hearts and our culture. Therefore I oppose it,” Sharma said. Sharma showed his full support to the second report of the Union Powers Committee that laid down the duties of the states and the provinces through their respective lists. When the report was being discussed in the Assembly, he expressed his opinion on what the attributes of a strong Centre should be. He also argued that a strong Centre did not necessarily undermine the powers of the country’s provinces. In another sitting of the Assembly, Sharma mentioned certain “charges” were made against the Constitution but gave a detailed justification in defence of it. One of the criticisms was that the Constituent Assembly had borrowed articles and other provisions from Constitutions of other countries but it did not take any cue from the constitution of the erstwhile USSR. Sharma argued that the USSR did not have a Constitution in the first 18 years of the Communist rule. The Soviet Constitution was adopted in 1936. Sharma also mentioned that unlike Mahatma Gandhi’s vision for India where individuals are considered to be “the basis of society and party and state”, in Russia it was the opposite: “the individual as such has got precious little value”. Sharma contested the first general elections of India in 1951 and was elected to the Lok Sabha from the Kanpur constituency. Then he became a Rajya Sabha member from 1957 until his death in 1960. He had also been a member of the Official Languages Commission, established in 1955 that was supposed to give recommendations to the government regarding the use of Hindi and English languages for certain official purposes. Sharma had campaigned vigorously for Hindi to be declared as ‘national language’ of India. He was awarded the Padma Bhushan for his contribution to the field of literature in 1960, just a few months before his death. He passed away on 29 April 1960. A college in Shajapur, Madhya Pradesh, has been named after him by the state government.